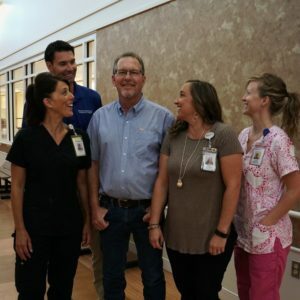 When Guy Brunner took off on a motorcycle trip out west last year with three buddies, he never imagined how the adventure would end…and how HealthSource Saginaw would play a vital role in getting him back on the road with his 2010 Harley Street Glide after his stroke. Five days into the 10-day trip to the Sturgis Motorcycle Rally , Guy woke up in the morning unable to move. One of his friends heard him thrashing around and flipped on the light. “He took one look at me and knew I had had a stroke in the night,” Guy remembers. After being evaluated at a local hospital near their rental cabin in Sundance, Wyoming, Guy was quickly taken by jet to Sanford Health, a major teaching hospital in Sioux Falls, South Dakota. “Too much time had passed for me to receive the clot-busting drugs,” Guy explains. Just by chance, a visiting physician giving a lecture at Sanford was able to perform an endovascular procedure call a mechanical thrombectomy to remove the clot in Guy’s brain causing the stroke. The complex procedure isn’t done at many hospitals. After 8 days in intensive care out west, Guy was ready to be discharged to an acute inpatient rehabilitation facility. He needed intensive physical, occupation, and speech/language therapy to regain the ability to use his left side and to restore memory and problem solving skills. He and his wife wanted to be close to home in Vassar, so they started Googling inpatient rehabilitation facilities here in the Great Lakes Bay Region. Physical therapy was “fun” because Guy’s team of therapists “switched it up” every time. Speech & language pathology, what Guy calls “mind therapy,” helped him in many ways, including apps to use on his phone for memory building activities and games. These three disciplines, over the course of just a few months, gave Guy the ability to go back and do his job again as a kitchen designer at Vassar Building Center. His bosses there were flexible in allowing him to work his way back from part- to full-time. He also got back on his bike, initially riding around his house until he was brave enough to go out on the road.